When our ninth graders came to school, iPads in hand, August, 2012, forming a tech “club” was the farthest thing from anyone’s mind. They were our first 1:1 iPad class, and all of the professional development focus was on the teachers. In fact, we were unprepared to give the kids anything but the most minimal orientation to the iPads. However, creating the opportunity for fourteen year olds who loved the iPad to form, self-direct, and prosper was an initiative that impacted the entire Mercy High School community for the good. The Mercy iWizards assist, serve, and encourage the MHS community to integrate iPad technology into their lives. Our purpose is to learn about mobile technology and to help promote, technology use to the fullest advantage. As a student-run technology group, we vow to provide a helping hand to every student and teacher. We have a special interest in introducing new students to the iPad. The iWizards are here to help. On August 16, they lived up to this Mission in a profoundly impactful way. 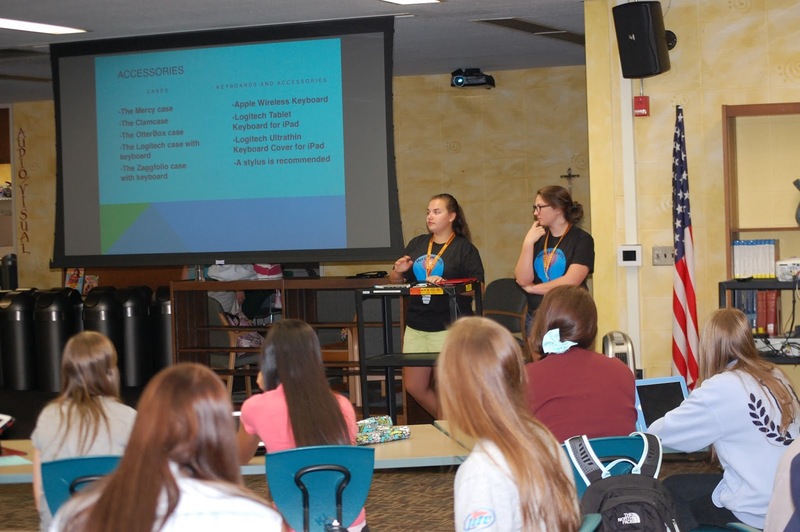 They delivered a Mercy iPad tech orientation to all of our students. The iWizards designed and taught this orientation. The process took several weeks of before school meetings and a major dress rehearsal on the last day of school in June. To their tremendous credit all iWizards attended the lengthy rehearsal. And each one maintained her dedication and came ready to engage our new students, last Friday. A shout out to our several staff members who assisted with registration and the wonderful photographs in the movie slideshow. Huge thanks to Lucy Gray’s workshop contributions as well. Enjoyed the video and glad the training day went well. It was fun helping register our new Mercy students.